I can hear the muttered groans: "another eastern front book". Just wait a minute, first because the book is fantastic, and second because it is not just another history. The author has spent a lifetime studying the eastern front, and not only that, he has come up with a new thesis. He challenges the etched in stone belief that the Germans were swamped by the Russians and could not keep up with the material and manpower losses. That should have perked up your ears. To begin with, the book is a treasure trove of information. It is not for the casual reader, or for someone looking for an overview. This book is a historian's goodie bag of minutiae about the German army and the first two years of the campaign in Russia. There are notes and references on almost every page. The bibliography is a full twenty-six pages! You will get the history of the OstHeer in the different operations during this two year span. The book not only shows the toll taken on the German Army, but also shows the terrible losses of men and materials that the Russians had to try to replace in that span of time. This is the first book of a new series called 'The Wolverhampton Military Studies' brought to you by the University of Wolverhampton. To quote from the series editor "With everyone of our publications we want to bring you the kind of military history that you will want to read simply because it is a good and well-written book, as well as bringing new light, new perspectives, and new factual evidence to its subject." With this first book in the series, they have succeed admirably. The first chapter of the book goes back in time to show the state of the German armed forces in 1919, and its tremendous growth spurt from 1933 on. It also shows the tremendous in-fighting between the rival services. All of this growth was based on a resurgent Germany to be ready for a major war in the mid 1940s. Hitler's miscalculation of the effect his invasion of Poland would have on the western allies is crucial to understanding that in reality the German armed forces where not ready at the time for a large war. Having bluffed and been able to conquer on the cheap until June 1941, you can see that in no way was Germany ready for a war on the scale it fought in Russia. The details of the book show that contrary to other histories, women were used in the work place at a higher level than the Allies at times. The surplus of armaments on hand were usually greater than their losses at most points. One thing the book brings out is even when the equipment was available in Germany, it was usually sitting by the rail heads unable to be shipped to where it was needed. The shortage of railways and of trains was felt from the beginning of the War in Russia until the end. 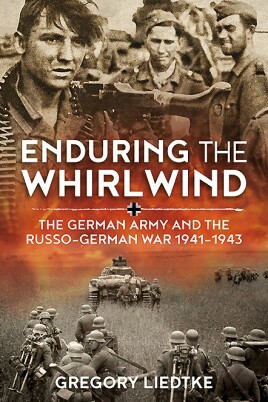 The author has shown that between June of 1941 and July of 1943, the Germans were able to mostly make up for their losses on the eastern front. The author's hypothesis can be summed up in the last lines of his 'Conclusion': "In short, the German Army was able to generate forces of prodigious strength three times in the space of two and one-half years. If these efforts were ultimately insufficient to produce victory between June 1941 and July 1943, the root cause of Germany's failure during the Russo-German War reside elsewhere." He is able to show that the German Army was sufficiently staffed and equipped by the start of the Battle of Kursk. There are only two points I would like to make on this assumption. The death and wounding of so many veteran soldiers in the first two years of war certainly had an impact on the Heers ability to function. Being able to fill a manpower shortage is not the same as still having the core elements of your army's 'old hands' at whatever post they filled. The other point is that many authors have shown that Kursk itself was not a bloodbath of armor and men for the Germans as was once believed. They have shown that the defensive battles after Kursk were the real blood-letters of the German Army in 1943. I would like to see the author continue and do a book on the German losses from July 1943 to may 1945, and be able to see what he is able to glean about the actual Germans' ability to replace the losses in this time period also. All-in-all, it is an excellent and well written book that lives up to the editor's ideas for this new series of military history books. I cannot wait for more in the series to be released. Thank you Mr. Liedtke and Helion&Company for this great read.